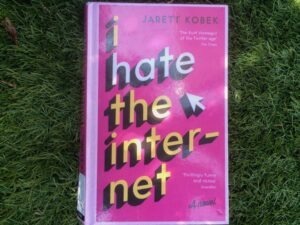 I HATE THE INTERNET by Jarett Kobek published in 2016, calls a spade a spade as it dissects the shortcomings of Western society paragraph by paragraph, delving deeper, much like the map menu on a computer before returning to the red line of Adeline’s story. The running gag of how to describe black and white with a biological description of colour or a lack thereof stays funny throughout. Easy to read in short blocks of text it makes you wonder how we all got it so wrong. Full of sneers it’s OMG and LOL.